The many benefits of having a healthy lifestyle are no secret to anyone. However, there is one fact that many people do not seem to be aware of: that our lifestyles before conceiving (men included) and during pregnancy have a direct impact on our children’s health throughout their life. Yes, even our grandchildren are influenced by the lifestyle choices we make today. The ability to pass down health to our future generations is through our body’s continual biological responses to our ever changing environments. These biological responses are referred to as epigenetics. Epigenetics are known as heritable changes in DNA function, without changes in the DNA sequence. This happens when a methyl group (a carbon atom attaches to three hydrogen atoms) attaches to specific sites on a gene. This process is referred to as DNA methylation. When DNA methylation occurs, it alters the gene activation and expression. Therefore turning the gene off or on, or even making it act quieter or louder. Why is this important when you’re trying to conceive? The most common environmental exposures resulting in epigenetic responses include: stress, toxins, type of nutrients we have available or choose to eat, and physical activity. The amount of exposure to any environment good or bad results in how the genes are expressed. Epigenetic responses during pregnancy have the greatest influence on our children’s health. Everything the mother is exposed to or experiencing the baby does too! Think of it this way: how her body responds to her environments send little messages to the developing baby’s cells telling them “this is how the world outside of the womb is and therefore the best way to survive is to develop for this type of environment in this way”. With this information their cells are working to develop a baby to survive in the world they are perceived to be born into. For example, when the mother is physically active during pregnancy the fetal cardiovascular system is also enhanced. This means right from the start the baby will have better cardio health because their mother is physically active! The fetal heart rate is lower in breathing and non-breathing movements. The babies also show enhanced tolerance to glucose. This means there is a decreased risk of diabetes into adulthood. 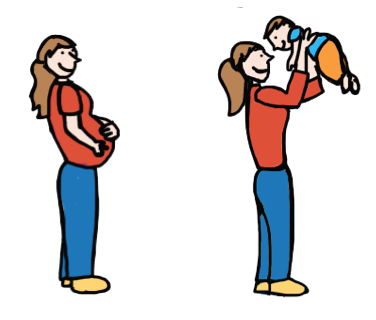 Even the level of emotional stress a mother has during pregnancy and how she responds to these stressors influences how the baby will too respond to stressors. Anything the mother consumes during pregnancy sets the foundation for the food choices the baby will make. When a mother consumes probiotics in her diet these same bacteria promote enhanced gut health for the baby and therefore a healthier immune system throughout life. Allergies and asthma have also been linked to the amount of pollution the woman was exposed to during pregnancy. Are these influences long lasting? The question has been asked if epigenetic changes are permanent changes. The answer today is, “possibly if they are consistent for many generations”. But we need to remember epigenetics should not be confused with evolution. Evolution changes DNA sequence. Epigenetics changes how our genes are expressed and built to be expressed in response our environments. Isn’t this information fascinating, knowing we can actually influence and set the foundation to our family’s health? The way I see it, this is the true meaning of preventive health. Better health can actually be a family legacy! I don’t know about you but I think this is a legacy worth passing down.